October 31st, 2015 | Moon in Cancer, trines Neptune Rx and the Sun, sextiles Jupiter, Venus and Mars, opposes Pluto, squares Uranus Rx and Mercury: Happy Halloween! The Moon is back home in Cancer, just in time for the Halloween celebration. Whatever we may be feeling now, know that we have the full support of our intuition and inner guidance. People say the veil between worlds is thinner on Halloween. With the Moon trining Neptune Rx and the Sun, forming a Grand Water Trine, we find a way to bring our inspirations down to Earth so that we can get a better hold of them. There truly is nothing to fear at this time, but the fear that comes from our own limited thinking. Perhaps we have been feeling stuck, like we should be further ahead than we are right now. The Grand Water Trine reminds us that this is not the time to complain, to compare, or to affirm lack. But to stay positive, uplifted, and inspired. One of the ways that can help us train our brain to stay positive is by challenging those negative thoughts. Each time a negative thought arises, we can choose how to respond. Instead of dwelling on downers, we can instead dwell on things that lift our spirits. Because when we are focusing on the negatives, we remove ourself from our ability to find positive solutions. We can also release thoughts that are self-deprecating by focusing on times when we were outgoing, playful and confident. Instead of thinking "I'm a failure." affirm, "I am open to the rhythm and flow of my ever-changing life." There is no green monster in the closet, as we will soon see, for they are mostly a product of our imagination. Let Halloween reminds us that we have it within us to step up, and that we are powerful and have access to divine wisdom. Spook away those worries and fears and open the door to our heart's upliftment. November 5th, 2015 | Moon in Virgo, sextiles Mercury and the Sun, squares Saturn, opposes Neptune Rx, trines Pluto, conjuncts Jupiter, Mars and Venus: Rediscovering the magic in the mundane. Has daily life been a little too mundane or ordinary for our liking lately? So where did the magic go? Know that magic is not always about flying fairies or dancing gnomes, but more about having a brand new awareness and understanding. To notice something that we didn't see before. To get a flash of inspiration from a stranger we meet on the street. To learn an easier way to do something at a new class we're taking. Magic can be found anywhere if we are open to it. Being more present in the moment is one of the best ways to 'see' things that we wouldn't have seen if we were in a rush. Walking more mindfully is another way we can stimulate our mind and strengthen our awareness. This means feeling our feet moving, focusing on the sense of stepping on the ground. And then start noticing the details of the experience. What can we see? How do we feel? It is time we do some clearing on an emotional level. To stop carrying around old, toxic emotions and feelings. To acknowledge our mistakes along the way, and to forgive ourself for what we have done in the past. This is not the time to look back and regret, this is the time to look forward and move on. We have it within us now to start again with more joy, better health and a new sense of inner peace. The keywords from Venus, Mars and Jupiter are: love, strength and perseverance. Get ready to open our eyes and see life in a new way. November 7th, 2015 | Dark Moon in Libra, conjuncts Lilith, sextiles Saturn, inconjuncts Neptune Rx, Squares Pluto, opposes Uranus Rx: Pre-New Moon Diary. Despite of what's happening in the world right now, is it possible for us to maintain a positive outlook? The Moon is dark in Libra as we are approaching a New Moon in Scorpio. Maintaining a positive attitude may take some work, because we are constantly bombarded with fear and negative news stories that do not bring anything but worry into our mind. Know that having curiosity about the world is one thing, being obsessed with negativity is another. What then can we do to remain optimistic in a world where most of the media outlets see public fear as 'growth industry'? Understanding that we determine our reality with our mind is one of the first ways we can shift our attention. When something happens, we get to choose whether it's a positive or negative experience and then react accordingly. Instead of letting anger, disappointment, or complaining take over, a positive attitude can help us become a better problem solver. Using language to shape our thoughts is another great way to revitalize our energy. Little changes in our language can change the way we think and how we act, because language shapes how we think about the world. Do our words uplift and heal us? Or do they make us feel down and discouraged? This doesn't mean that we use words that do not seem genuine to us, but we can start by using words that make us feel better. It is time we put our boundaries into place. To not be afraid to ask others for help, or to allow others to help us. To say no to activities which can drain us. And to spare some time to recharge our batteries whenever we feel overwhelmed. This can mean taking a few hours on the weekend to read a positive book, or taking a few days off for a holiday. If we are not in the position to travel, we can always have a holiday at home where we simply switch off from the outside world and spend time doing things we love. So what are we going to choose next to help us move beyond our past limitations? November 13th, 2015 | Moon in Sagittarius, conjuncts Saturn, sextiles Venus, squares Neptune Rx and Jupiter, trines Uranus Rx: Post-New Moon Diary. The ongoing square aspect between Saturn and Neptune has been guiding us to look at the connection between dreams and reality in a new way. And the tighter the square gets, the more pressure it begets. The more that we want to escape and go on an adventure, the more that responsibilities are calling our name. Is there a way out of it? Or at the very least, a way around it? Well, for some of us that are perhaps experiencing this transit more apparently than others, the only way out is to work together with time, and not against it. This means remembering to include some time for play along the way, or even as we go along. Playfulness, good humour and laughter can lift our spirits so that we can return to work feeling revitalized and with a renewed perspective. Regardless of our current situation, now would be a great time to bring back a sense of balance and moderation into our life. What is out of balance? The first answer that comes to mind is what we need to figure out to get back into balance. Remember that play is just as necessary as work, the same way exercise needs to be balanced with rest, and so forth. So instead of feeling bogged down by pressures or responsibilities, we can see them as stepping stones to go to that next level of awareness and consciousness. November 15th, 2015 | Moon in Capricorn, squares Mars, Venus and Uranus Rx, sextiles Neptune Rx, Mercury and the Sun, conjuncts Pluto, trines Jupiter: The new awareness is finally here. That strong feeling we have, that a change is needed now, has come for a reason. After all that we've been through in the past couple of days, we can finally see the world in a new light. And with Mars now moving through Libra joining Venus, we are seeing a new chapter in our sense of solidarity. Bearing the symbolism of the God of War, Mars in the sign of balance brings a wanting for justice. We might be looking for justice because we want it now. Know that there is no other way forward at this time but to work together to reach the justice that we are searching for. Regardless of where we are now in the world, or at what point we currently are in our life, do not let anyone or anything make us lose confidence in our own power. This can be a great time to work on ourself, and healing old emotional pain, to make room for even more love and light to permeate our life. There is wisdom here. Can we see it? Can we feel it? If not, perhaps it's another time for us to look inward to see what our soul is trying to tell us. We could find our ideas and inspirations picking up speed as the new week begins. Keep our feet steady on the ground and our mind open. A new breakthrough is on its way. November 17th, 2015 | Moon in Aquarius, trines Mars and Venus, sextiles Saturn and Uranus Rx, squares Mercury and the Sun: Taking that first step to a new and lasting change. What can we do differently today to transform an old habit or belief we have about ourself and our life? Collaborating with reality is one of the first steps we can take to make progress and manifest what we desire. There is wisdom in taking action. There is courage in our willingness to make a positive change. A breakthrough is possible when we are open to it. Being open to a breakthrough means being open to how our life unfolds. Sometimes it is a subtle change that we are feeling. Other times, it is a more obvious change that we are ready to make that perhaps we weren't ready to make before. Once we are open to it, that's when the magic happens. We could have a realization at this time that will help us see more clearly. And this new understanding will set us on a positive course that is more in an alignment with our heart's truth. Know that seeing the truth can sometimes shatter old illusions or even upset us if we are resistant to change. Have faith that we will recover and open the door to a brand new beginning and an emotional healing. This could involve us making changes in our career, or even doing some kind of activism work with like-minded group of people. Whatever it may be, embrace the power that comes from taking charge of our own life. November 20th, 2015 | Moon in Pisces, squares Saturn, conjuncts Neptune, sextiles Pluto, opposes Jupiter, trines the Sun and Mercury: Hail Neptune! Neptune is now moving direct after going retrograde in the sign of Pisces since June of 2015. Wherever transiting Neptune falls in our birth chart, that's where we find most inspiration. Bearing the symbolism of the God of the Seas, Neptune rules dreams and illusions as well as inspirations and spiritual energies. With Neptune going direct, the door to our imaginations can be re-opened. But not without some kind of struggle or hard work along the way, as Neptune is still in a square aspect to Saturn. A situation that we have been concerned about can be resolved through regaining balance. Perhaps moderation is the key to achieve that balance. In essence, the Saturn/Neptune square is asking us to look at what part of our life is out of balance lately. Perhaps there is a need to incorporate more self-care into our schedule. This is especially true if we haven't been feeling or sleeping well. We may feel pushed to our limit and wonder how we would have time to add more to our schedule. Now would be a great time to look at how we use our time. We are in a period of letting go of situations and relationships that have served their purpose. This is also true of letting go of anything toxic in our diet. Know that by releasing old, toxic energies, we make room for abundance to come into our life. By being more open to receiving, we can be more receptive to new ideas that could lead to abundance. Keep this vision in mind, have faith and let the energies of healing begin its magic in our life. November 22nd, 2015 | Moon in Aries, trines Mercury and Saturn, opposes Mars and Venus, squares Pluto, conjuncts Uranus Rx: Making way for a new chapter in life. Trusting our instincts to make new and more solid decisions. Keeping our heart and mind open to new adventures and experiences. Where can we go from here? How can we evolve and grow into becoming more of our most authentic self? The road is open for new experiences. There are strong emotions brewing within, signalling a time of major change. We have learnt a lot from old, toxic experiences and we are now ready to begin a brand new cycle. We also have a higher sense of self-esteem and value our time more. Now is about making clear decisions about what changes we need to make to free up our energy and time, so that we can devote our time to more meaningful and purposeful activities. To make new choices on how we will spend our time, with whom, and where. We may not see it today or tomorrow, but we will look back in a few years and see how much progress we have made in honoring our instincts and following our soul's guidance. We may even be grateful that some things didn't work out the way we once wanted them to, because they have led us to a new and even better path. The key is to keep being truthful with kindness and respect to ourself. Once we express that true authentic self, we will feel an increase in energy and inspiration. Notice how much lighter we feel as we release the heaviness of all that we have held inside. Now is indeed the time to trust in our own instincts and move ahead. November 24th, 2015 | Moon in Taurus, inconjuncts the Sun, Mercury, Saturn, Mars and Venus, sextiles Neptune, trines Pluto and Jupiter: What is our true essence? Beyond everything that we consider as 'mine', what do we see as our truth? The whole truth that lies beneath the surface. How about our connection with the inner self? What can we see when we are alone with our thoughts? Do we have a positive or a negative outlook? If we do have a negative mind chatter, can we shift our thoughts with our imagination? Imagine things finally working out in our life. Imagine our plans going well. Imagine what we want to happen, happens the way we wanted it. Imagine that we are safe and protected wherever we may be. How do we feel? Can we feel some kind of internal shift? This is not an exercise on how to avoid reality, but more to see the kind of relationship we can have with our own mind. So many of us often forget that we are not living in the past, or the future, but in a living, breathing present. This is mostly because we are juggling too many things at the same time. We may have responsibilities to attend to. Problems that need to get solved. Other people or even animals in our life that we are are constantly interacting with. As we are approaching a Full Moon in Gemini, we are guided to release pent-up emotions through heart-to-heart conversations. It can be a literal conversation with another person, or it can be a conversation with the inner self. The point is to release and detox tension, stress and anxiety from our body. Notice the signs that are pointing the way for our next steps and that serve as a reminder that we are in the flow. Have faith in the flow of life. We have it within us now to begin a more aware and vibrant journey where we feel more at one with our body, soul and spirit. disempower you. 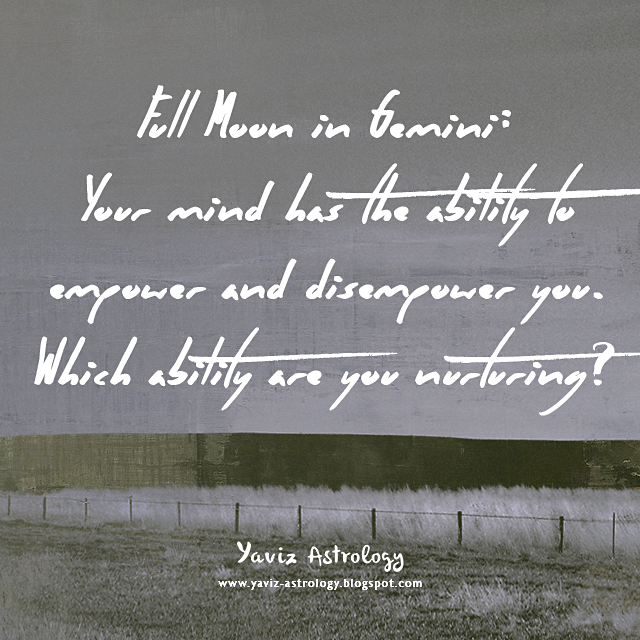 Which ability are you nurturing? As we observe the inner workings of our mind, what can we see? If we were asked to describe our mind in one word, what word would it be? The first word that comes to mind is what we believe to be true about our mind. It may not be the whole truth, because our mind is more vast and complex than we can describe in one word. But it can be a pretty good indicator of ideas and beliefs we have about our life. Remember that our mind is growing every day with every experience we encounter and every inspiration we get. So there is no one way to work out the ultimate way of thinking. There is only awareness and understanding that we can cultivate as we learn something new each day. Regardless of how we are feeling now, we always have the capacity to transform our mind. To let go of old, outdated values and internal programming we have that are holding us back. To communicate our mind in a new way so that we can develop a more authentic connection with others. To shift our thoughts from beliefs that are disempowering, to ones that are more empowering and encouraging. The key is to keep an open mind. With an open mind, we become a conduit for inspiration and hence make way for life's revelations to come into our life from different people and places. By nurturing more empowering thoughts, we empower our heart and soul at the same time. By cultivating more positive thoughts, we liberate our mind from the shackles of our old disempowering thoughts. Become our own source of empowerment with our own empowering thoughts! Happy Full Beaver Moon! The Moon in Gemini is forming an opposition to the Sun, Saturn and Mercury in Sagittarius, marking an extra intellectual and ambitious Full Moon in the sign of the Twins. There could also be extra tension, because an opposition to Saturn usually brings a feeling of being limited or restricted in some way. Perhaps due to some kind of unprecedented duties that we have to attend to, or perhaps because we feel there just isn't enough time or enough resources to do the things that we want to do. The name Beaver Moon itself comes from the colonists and Algonquin tribes that choose to set the beaver traps during this time to ensure a supply of warm winter furs before the swamps freeze over. The name also comes from the fact that beavers are more active at this time of year as they prepare for winter. With a Full Beaver Moon happening in the sign of communicative Gemini, we get a brand new understanding in the importance of communicating in an open and honest way. Just like a strong and resourceful beaver that is patient in building a river dam, we are guided to have more trust, faith and patience in building our own communicative abilities. It takes a lot of practice and making mistakes to get a deeper understanding of how our mind works. There could be pressures or even insecure outburst moments along the way. Have trust that it's all part of our mind's growing transformation. The process from communicating from a place of disempowerment, to communicating from a more empowered place within us. Be aware of this process, and let the power of mindful communication transform our relationship with life. With both the Sun and the Moon forming a square to Neptune, we are craving simplicity, peace and emotional fulfillment. We are ready to step into a new phase and make a change, even if we're not sure what that change is. There could also be some kind of dissonant between what we believe to be the truth and what is actually happening in reality. So try not to be too hasty in making assumptions at this time, as things may not be as they appear. Going with the flow will be great but do keep our awareness in check. Knowing when to talk and when to keep quiet might be one of our ongoing struggles in life, and now we have an opportunity to work on this issue. Know that nothing can cloud our mind more than negative thoughts. It is time to forgive those thoughts, and to focus on all the lessons that we have learnt along the way. The Moon is also forming a trine to Venus and Mars and a sextile to Uranus Rx, and we can be thrilled with new connections we make as there is always something new showing up. Just when we think we have them figured out, out pops more surprises. We suddenly remember that there's a whole world out there waiting to be discovered by us and plenty of new things to learn and new people to meet. We are feeling more emotionally aware and speaking from the heart can bring great relief and understanding. The Full Moon reminds us to have faith, courage and the belief to begin our new journey from within. To remember that life is a wondrous circle, in which all things are passing and yet, have always been and will always be part of our soul's evolutionary cycle. We are moving forward with new faith on our path. And with it, comes greater feelings of trust, courage and spirit. 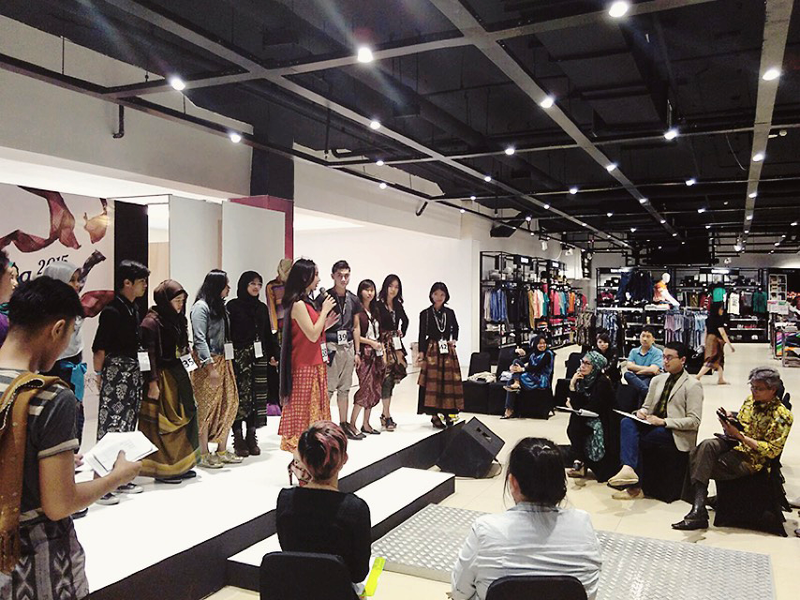 fashion competition, so I was a bit nervous but happy and grateful at the same time. 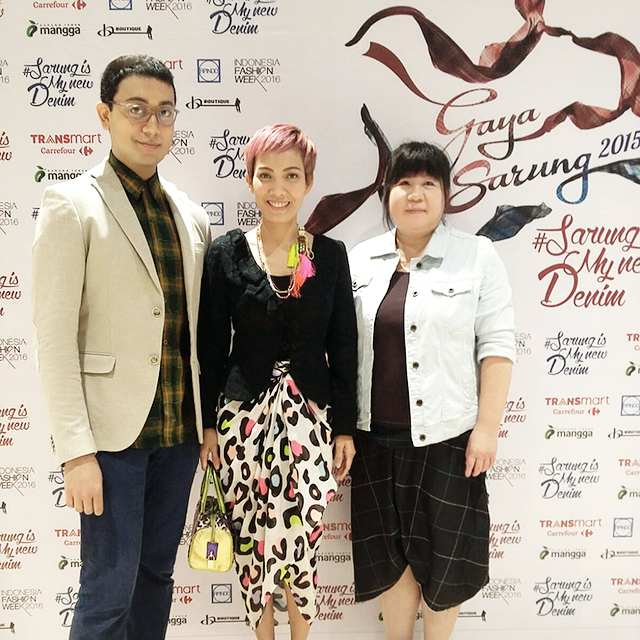 again congratulations to all the semi-finalists of Gaya Sarung 2015! 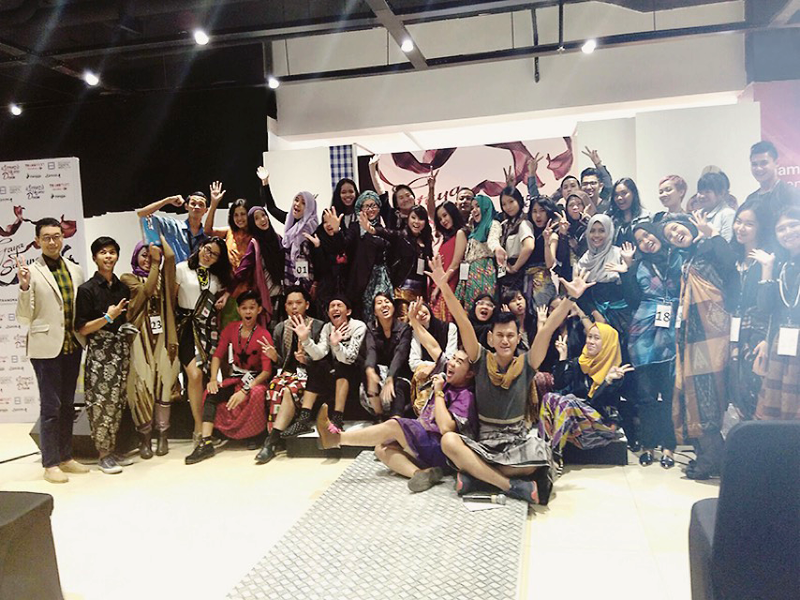 A group photo with all the semi-finalists of Gaya Sarung 2015! The ability to grow is directly related to the amount of insecurity you can take in your life. 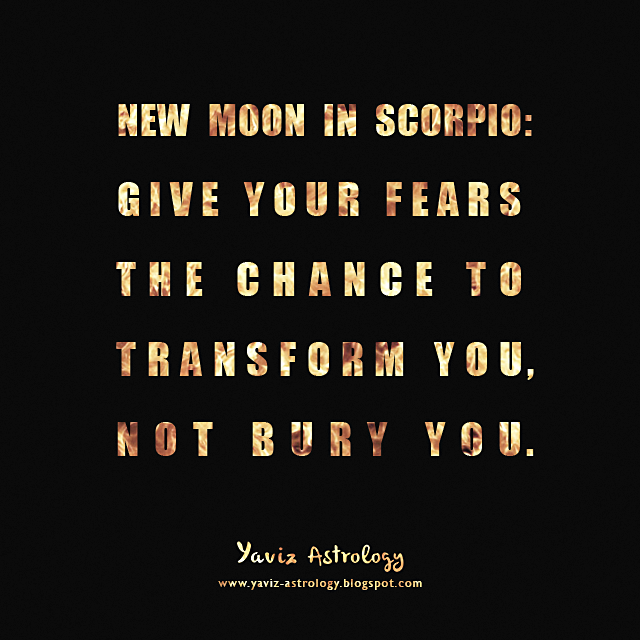 New Moon in Scorpio: Give your fears the chance to transform you, not bury you. Can we hear what our fears are trying to say? If we can, are we truly 'listening'? What does it mean to listen to our fears? It means delving deeper into our inner world to uncover the root cause of our fears. And if we're willing to look closer, we will see that the root of all fears is fear of the unknown. "If I do this, what will happen to me?". "If that happens, what will happen to my life?". "If I go to that place, will I be safe?". This doesn't mean that knowing the outcome of a situation in advance will make us feel better. Well, it does only if we know the outcome will match to what we actually want to happen. But what if it will not? This kind of question is the beginning of all worries that come into our mind. Does this mean that we shouldn't care about what will happen to us? No. It means that we shouldn't forget where our personal power currently resides. The present moment. Trusting our intuition or instincts is the first step we can take to better prepare for a future moment. If we are not ready to do something, simply don't do it. Especially if it involves anything that could jeopardize physical safety. Know that when we are finally ready to do something, that's when we will do it no matter the outcome. Then how about those people that say, "If not now, when?". Well, if we are truly not ready to do something, we wouldn't do it anyway. And if we end up doing it, it means that we are ready to face whatever the outcome — which in other words means that we are ready in some way. It is time for us to be gentle with ourself. To honour each step we take along the way. To not let our fears or insecurities define us, but to listen to them in a way that can enlighten us. Listening to what our fears are trying to say is the first step to finding our inner courage. Happy New Moon! The Moon is in Scorpio conjoining Mercury and the Sun, marking an extra intuitive and intellectual New Moon in the sign of the Scorpion. What we discover within can bring in a new revelation about our long-held emotions and feelings. Perhaps we have been guided to look at our fears under a different light. Or perhaps we have been trying to break through old blocks to live more freely and courageously. Regardless of what we may be trying to release at this time, we have the celestial support to begin again. To start a more confident cycle where we are more in tuned with our soul. To let go of old, outdated beliefs we have about who we are because we are a different person now. If we're looking for the right time to transform our life, there is no better time to do it than this New Moon. New Moons in general, are a great time to plant new seeds. To state new intentions and begin a brand new cycle. To see old situations in a new way so that we can move forward with new eyes. What do we want to see? What can we do to grow and evolve? With a New Moon happening in the sign of Scorpio, we get to start again soul deep. Ruling the 8th House in Astrology, or the House of Intimacy and Self-Transformation, Scorpios are known for their intense emotions and dynamic personality. They may seem obsessive, suspicious or manipulative at times, but they are generally loyal and passionate people who are not afraid to dig deep to find the ultimate truth. Authenticity is very important to them and they expect nothing but honesty from other people. With Scorpio's ruling planets, Mars and Pluto currently in practical Earth signs, the doors are open for us to have the ideas, the drive and the self-discipline to manifest our desire. The Moon is also forming a trine to Neptune Rx and Chiron Rx, and we are ready for our heart's detox and healing. Once we have gotten rid of stuck old emotions, we are ready to be more attuned to that higher self and aligned with the deeper love and wisdom of our heart. This is our time to shine in our own divine light. The more that we can open our eyes to the beauty that lies within us and all around us, the more that we can inspire and uplift others. Be open to learning new skills and information. We could feel inspired to do some research related to our dreams, intentions and life purpose. This means spending time doing reading, online research, meditating, or taking a class. With the Moon's sextile to Pluto and Jupiter, trust the messages we get, and listen to our inner truth. Especially if we get an intuition to change or improve our plans. Do not allow fears to limit our choices. Change is indeed on the way, but we shouldn't fear anything new. Embrace the unknown with a positive mindset. Remember that we have come a long way, and there's still a lot to learn. The New Moon reminds us that our emerging spiritual awareness has helped us to look and feel deeply within ourself, without denying what we find. Our task - as a cosmic being awakening to our potential, is to recognize that we are capable of being conscious. And when we realize that being conscious feels richer and more vivid than we might have imagined, then we are able to experience genuine spiritual transformation. There is no other way forward now but to recognize, accept, and heal the inner stuck fearful patterns. It is time we give our fears the chance to transform us into becoming our most authentic, empowered and awakened self.